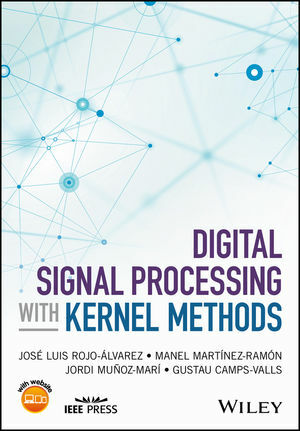 JOSÉ LUIS ROJO-ÁLVAREZ, PhD, is a Professor in the Department of Signal Theory and Communications at the University Rey Juan Carlos, Fuenlabrada (Madrid) and Center for Computational Simulation, Universidad Politécnica de Madrid, Spain. MANEL MARTÍNEZ-RAMÓN, PhD, is a Professor in the Department of Electrical and Computer Engineering at the University of New Mexico, Albuquerque, USA. JORDI MUÑOZ-MARÍ, PhD, is an Associate Professor in the Department of Electronics Engineering at the Universitat de València, Spain. GUSTAU CAMPS-VALLS, PhD, is an Associate Professor in the Department of Electronics Engineering at the Universitat de València, Spain.